If you’re looking for the perfect Father’s Day 2018 gift for your dad, a smart thermostat that’ll save him hundreds of dollars each year on his energy bills might be as good as it gets. 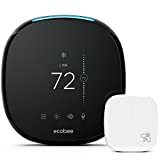 The Ecobee4 Smart Thermostat with Built-In Amazon Alexa is arguably the smartest smart thermostat on the market right now. It features a wonderfully sleek design, Alexa integration and Alexa voice control (which means it basically has an Echo Dot built right in), compatibility with every major smart home system, and it ships with a room sensor that you can place anywhere for more accurate temperature monitoring. At $40 off it’s still $10 more than the Nest Learning Thermostat right now, but it includes a room sensor and Alexa voice controls, which are worth well over $10. ALEXA BUILT-IN WITH SPEAKERS AND MICROPHONES: its like having an Amazon echo dot built right into your thermostat!